Hello everybody and welcome to the latest Blocknet newsletter! This newsletter is released twice per month to keep the community up-to-date on what is happening with Blocknet. You can view all previous newsletters here. XRouter is undergoing continued heavy development as it’s being prepared for release. Some improvements include additional calls, enhanced performance with query handling and request optimizations, additional fee flexibility and rate limiting, and better logging. Various bug fixes such as the ability to right-click paste addresses in the order form, order ID being cleared when changing buy/sell tabs on the order form, and listing the asset names in the market selection dropdown. In addition to these merged fixes, the specification has been completed for an improved and simplified configuration setup. Checkout DX Maker Bot, an XBridge market making bot that has undergone some refactoring and improved documentation to help make it easier to get started and provide liquidity to the order books. Any orders placed with this bot will also be visible on Block DX, the decentralized exchange powered the Blocknet Protocol’s XBridge API. More improvements on the way! There is a new API endpoint for viewing all XBridge trading data for the last 24 hours (based on 1440 blocks). Check it out here. We are happy to announce that we are now live on Delta Direct! 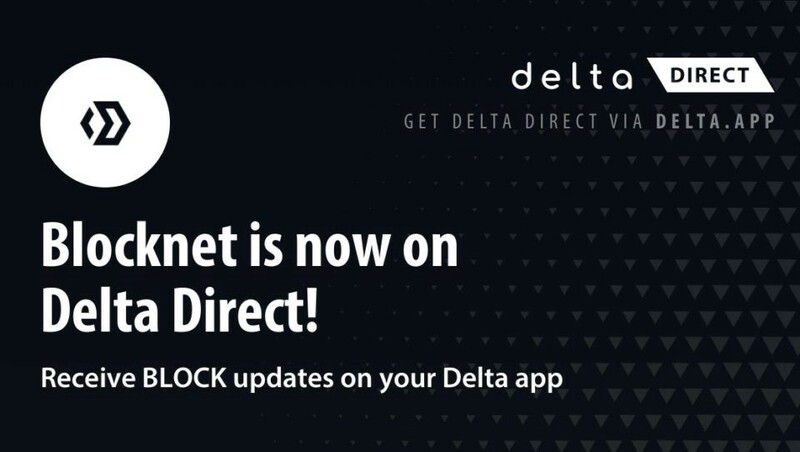 All of our latest updates will now be directly available on the Delta app! Make sure to enable notifications for our Direct updates so you never miss out! The Delta app is available for both desktop and mobile. Get Delta Direct here. The documentation portal has been updated with information on XBridge, a Service Node setup tutorial, and various other improvements on existing content. Take a look here. Arlyn Culwick has published a new article on his blog: “A design for decentralized organisations, in four parts”. Check it out here. How to upgrade the Blocknet Wallet in Linux, Install or run Qt from Command Line. UAT-820800: 7810 BLOCK: 82 / 0. Net: 82 Passed. hanniabu-laptop: 1200 BLOCK: 95 / 0. Net: 95 Passed. hanniabu-820800: 3900 BLOCK: 93 / 0. Net: 93 Passed. atc-mm-sb820800: 635 BLOCK: 94 / 0. Net: 94 Passed. atc-dev-sb820800: 175 BLOCK: 95 / 0. Net: 95 Passed. infinity7592-mar19: 385 BLOCK: 49 / 0. Net: 49. Passed. The in-progress (and previous) proposals can be viewed on block-node.info, on blockdx.co or within the Proposals screen of the wallet. Please note, proposals are being submitted to the forum individually so please make sure you scroll down and take your time to look over each proposal. An introduction to Superblocks and a guide to submitting and voting for proposals, can be found here. There is also a proposal category in the Blocknet Discord for focused and specific discussion of proposals and ideas. Within this category, there is a channel called #anon-snode-feedback for Service Node owners to provide anonymous feedback on proposals. For Service Node notifications such as critical updates or voting reminders, join this mailing list. (Separate to the Word on the BLOCK newsletter email list). Blocknet Service Node stats can be viewed on Master Nodes Pro, on Masternodes Directory, and on Block Core. BLOCK is now available to trade on the FEX Exchange. Read more here. Coin announcements are continuing. We would like to welcome the Noir, Hash, Bitcore and Rapids developers and community to the internet of blockchains. We look forward to seeing NOIR, HASH, BTX and RPD traded on Block DX. Be sure to check out the most recent additions to Block DX in the token recap here. You can view the full list of over 100 assets on the Blocknet Coin Hub. Twice per week, Twitter and Discord polls are now created for the next token to be added to BLOCK DX. The Blocknet Protocol currently supports 102 blockchains, all of which can be traded on Block DX. A full list of the supported assets can be found on the Blocknet’s Coin Hub. You can also view the current prices, ranking and market cap of of these assets (including BLOCK) on the same page. In addition to this list, there are another 22 blockchains that are unannounced. 137 assets are in progress for error resolution + finalization. Many thanks for reading. We hope that you are as excited as us with what the future holds for Blocknet. A decentralization project fundamentally requires an engaged community, and so if you would like to help with anything, have something to add, use your professional skills or have a problem, we want to know about it. Please also be aware that a community project is run by a diverse group of people with varying time-constraints (in a number of time-zones) and personal lives, so remember to be kind and patient! If you want to be the first see these updates, you can receive the newsletters directly to your email by subscribing here. Our next update is due on March 30th. Until then we look forward to hearing from you!